We welcome friends and family members to remember a loved one this year by adding a butterfly to our Tree of Lights. This annual tradition at Hope has a special history and has become a cherished ritual for many of our supporters. The white butterflies on each Tree represent the loved ones who we remember all year long and who we especially want to honor and memorialize during the holiday season. A gift of $25 ensures the placement of a personalized butterfly. 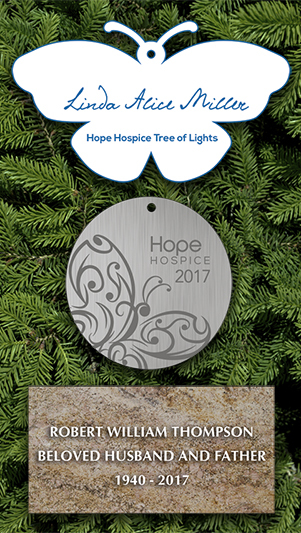 With a gift of $50 or more, donors will also receive a 2017 metal keepsake ornament for their own tree. Dedication stones for our Tribute Gardens are also available for $250 and come with all the benefits listed above. Ornaments may be purchased at the front desk of each Hope Hospice House or at Donate.HopeHCS.org/TreeofLights.